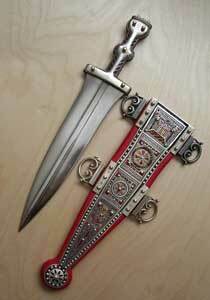 he pugio (plural: Pugiones) was a dagger used by Roman soldiers as a sidearm. It seems likely that the pugio was intended as an auxiliary weapon, but its exact purpose to the soldier remains unknown for sure. It was part part of the "military belt" that was worn at all times by the soldiers — a "status symbol" if you will to show they were soldiers. 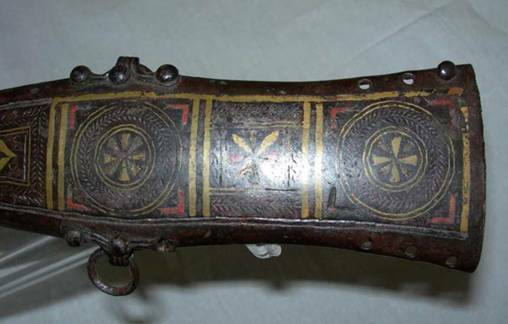 It is thought that the pugio was usually highly decorated due to its being a personally bought item and as such, soldiers, like those today, tended to like to "improve" their kit. It is thought that many soldiers spent their money in their kit as they had no way to invest it. Attempts to clasify the pugio as a utility knife are misguided, as the form of the pugio is not suited to this purpose. In any case, utility knives in a variety of sizes are common finds at Roman military sites, meaning there would be no need for a pugio to be used in this way. 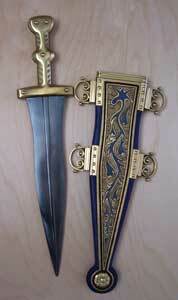 Original Leeuwen dagger and scabbard. 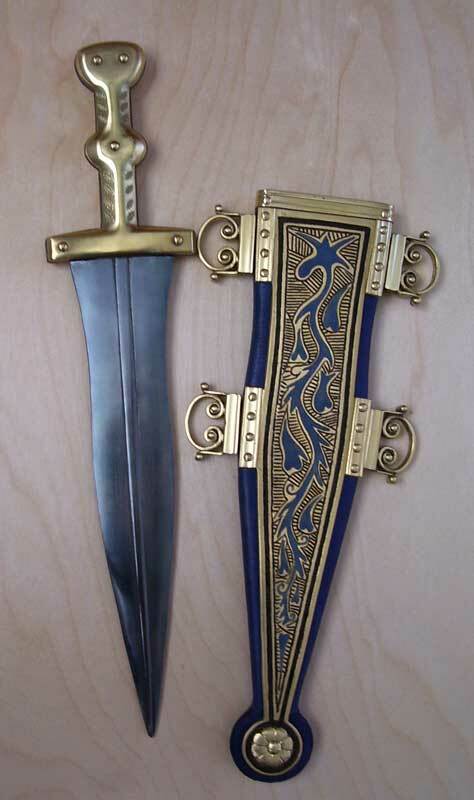 The dots are actually cast in strips and the strips soldered to the scabbard. 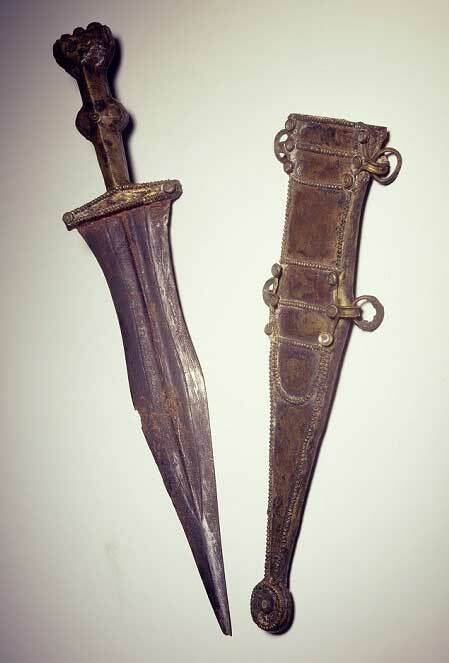 Original Leeuwen dagger and scabbard side view. 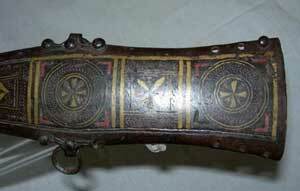 A view showing the blade also, which is in a remarkable state of preservation. Here are some reproduction daggers to show what they would have looked like in all their glory. Thanks to Brian Stobbs for sending photos of his wonderful work!! A beautiful reproduction -- not sure who made it. Pix was sent by a friend. The pugio was accommodated in its own sheath. By the second quarter of the 1st century AD three types of sheath were in use. All of these had four suspension rings and a bulbous terminal expansion which is pierced by a large rivet. Both depictional evidence and the evidence of wear patterns on surviving examples show that the two lower rings were unused. The first type (type "A") was made with a curving metal (normally iron) plate at both front and back, surrounding a wooden 'lining'. The front plate was usually heavily decorated with inlaid brass, silver, niello and red, yellow or green enamel. These sheaths featured round free-running suspension rings, attached by bifurgated mountings which were riveted on. 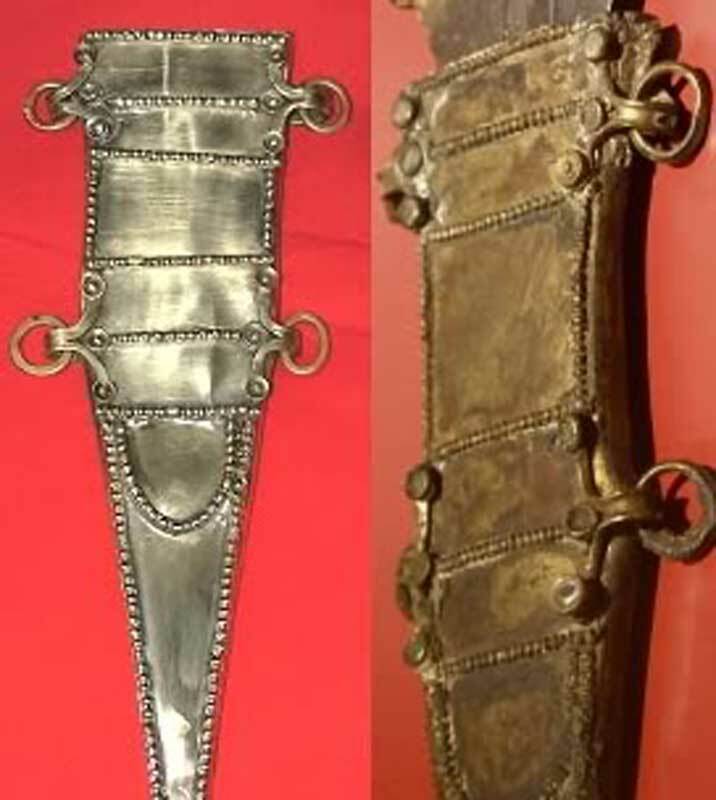 Modern reconstructions of these sheaths which feature applied brass plates attached by rivets are incorrect and nothing of this type has ever been found. This common mistake is derived from a misinterpretation of a line drawing in an archaeological report of an iron type 'A' sheath decorated with silver inlay and decorative rivets. 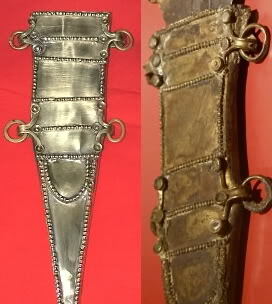 The second type (type 'B') was a wooden sheath, probably covered with leather to the front of which a metal (almost always iron) plate had been attached. This plate was fairly flat and was heavily decorated with inlaid silver (or occasionally tin) and enamel. 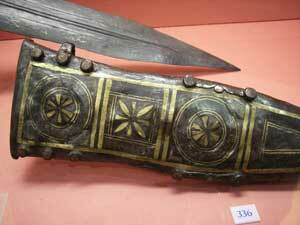 The suspension rings resembled small Roman military buckles and were hinged to the sides of the sheath. The third type ('frame type') was made of iron and consisted of a pair of curved channels which ran together at the lower end of the sheath, where they were worked into a flattened round terminal expansion. The channels were joined by two horizontal bands at the top and middle of the sheath and these bands also retained the suspension rings, which were round like those of type 'A' sheaths. 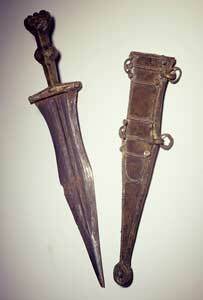 These sheaths would have been built around a wooden core, which does not survive in the archaeological record. Here is a great drawing by Crispus... 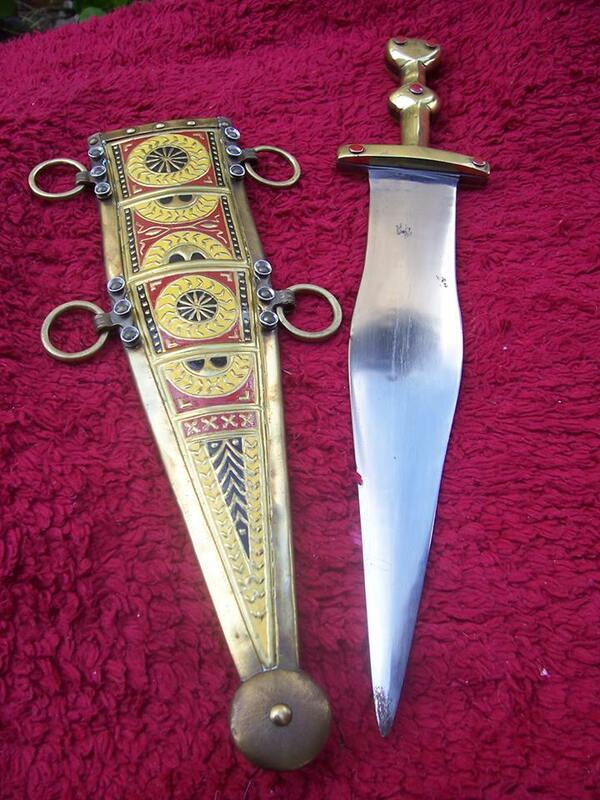 This really shows the differences in the types of Roman daggers and the proper nomenclature for their parts. 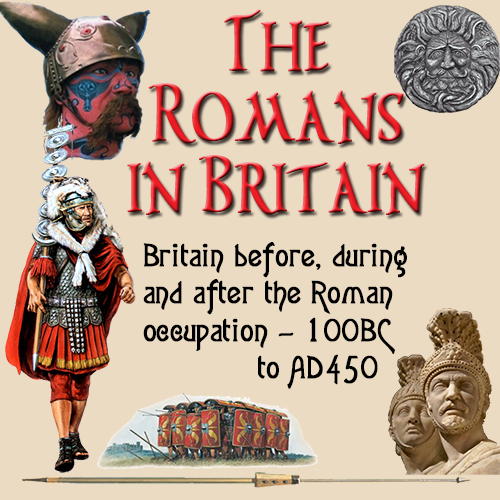 Vegetius may be overstating this point however, as there are a number of surviving Roman depictions of soldiers slashing with their weapons, as well as stabbing with them. 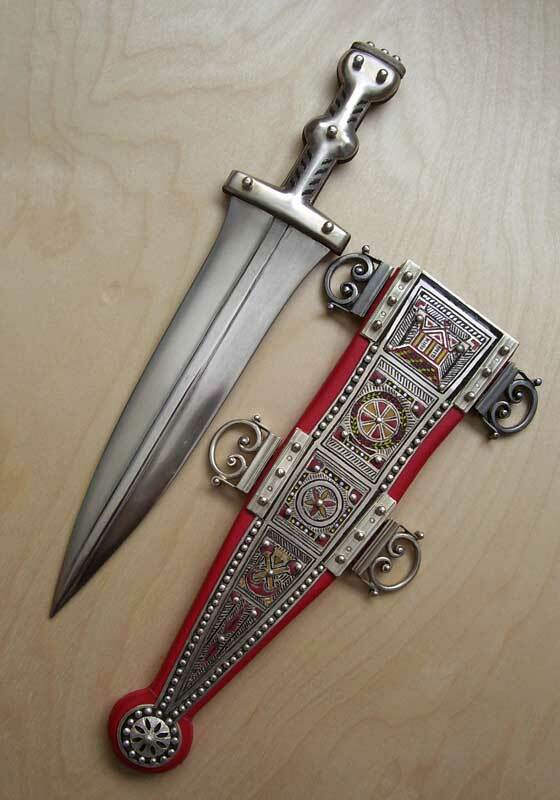 The pugio (dagger) was ornate even by Roman standards. It was worn on the left side of the body, attached to the balteus, the soldier wore around his waist. 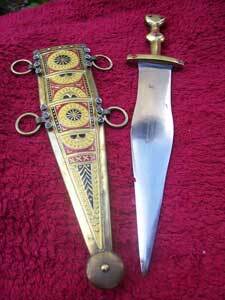 The handle was shaped to fit snugly in the hand, and the blade was fashioned from either iron or bronze and pear shaped. 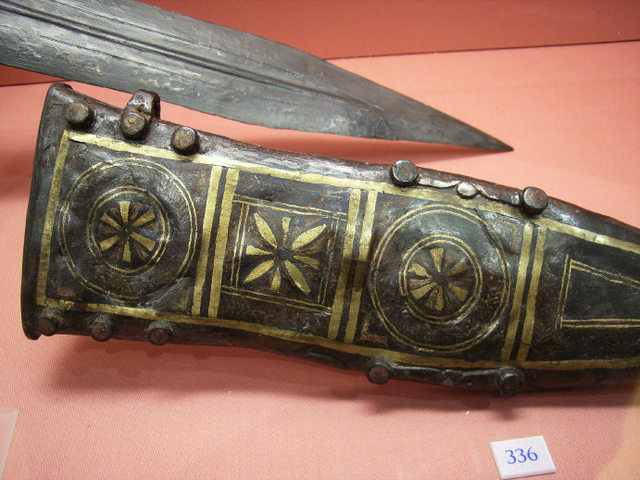 This unusual shape to the blade did not fit with the traditional Roman trait of making weapons to be functional rather than decorative.